The scope of these new services is to create alternative methods for integrated pest management (IPM) techniques and to gather knowledge of pollinating insects colonies. Used in video mode, the BEECAM camera daily records video sequences at programmed hours. The sequences are then batch processed on a PC thanks to the counting software AGATHE. This software analyses the beehive inputs-outputs and generates a spreadsheet file giving the time, the positions and the number of detected insects. 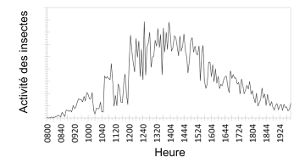 The counting software AGATHE (running on Windows 7 or later version) analyses the timestamped video files that have been recorded by the BEECAM camera. The software gives the number of enterring and leaving the plant, the input and output location coordinates, the time (precise to the second), the total amount of inputs and outputs. An activity map quantifies the insect activity at different times of the day. The BEECAM camera, used in still photo mode, records a serie of images (timelapse) allowing to follow the evolution of, for example, the replanting of a dune, to monitor the snow falls... and much more. can be programmed to shoot upto 250 photos per day. 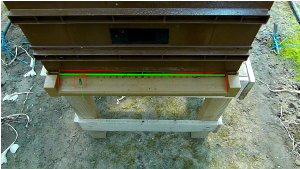 The BEECAM camera records each day a photo of the plant area to be monitored. The resulting filmstrip shows the plant evolution. This film can then be analysed by a software that determines the parameters evolution trends.